I’ve posted in a few places that I consider myself to be both an atheist and an anti-theist. I think that deserves an explanation. By atheist I mean I am aware of no evidence for the supernatural, neither a god nor fairies nor magic spells. In fact, it is my sneaking suspicion that the supernatural by definition cannot exist. The mere fact of existence simply means what we think of as natural is incomplete and in need of revision. If, for instance, fairies were demonstrated to be real, that wouldn’t make them supernatural. We’d simply need to expand our laws of nature to admit fairies. I’m not holding my breath, though. Note that atheism as I’m defining it doesn’t say “there is no God.” It simply says that if evidence for a being fitting the description were to one day show up, we’d need to redefine our notion of the natural world to take such a being into account. Arthur C. Clarke said any sufficiently advanced technology is indistinguishable from magic. I actually disagree. I think, when confronted with so-called “magic”, we humans would investigate it and find out how the magic works, making it part of our understanding of the world. Not only, then, is there no evidence. There in a sense can be no evidence. This sort of atheism is, frankly, kind of boring. Much more interesting is anti-theism. In doing some digging, I’ve found lots of negative reaction to this word. For instance, people compare it to anti-Semitism, which carries connotations of hatred toward particular people. I want to re-define anti-theism and anti-theist for my own purposes. So first let me state what anti-theism is not. My anti-theism does not involve a wish to impose a non-religious mindset on others by fiat. Freedom of thought is perhaps the greatest freedom of all; I would not (even if I could) make religion (or anything else) a thought-crime. I would also not restrict the practice of religion (except as it infringes on the rights of others – your belief in your god should not keep me from buying wine on Sundays). Finally, my anti-theism does not mean wiping religion from history. We need to understand ourselves, where we come from and how we got here. Understanding the way religions have molded and shaped societies, for good and ill, is a part of that learning. 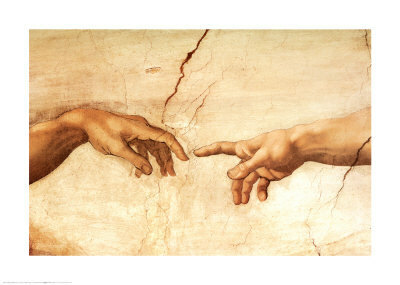 Michelangelo’s Sistine Chapel is a masterpiece, even if it is a portrait of two beings who never existed. What I do mean is this. While I see no evidence for God (that’s my atheism), even if I did, I would not worship such a being. It’s almost a shame that the God of the Bible doesn’t seem to be there, because I believe to oppose such a bully would be a worthy way to spend one’s life. And while I don’t ever want to impose thoughts on others, I do believe that if through gentle persuasive argument I could convince others to become anti-theists (maybe even more than atheists), I could help make the world a little better. Not that most people who believe in God are immoral; quite the contrary. I think, though, that their morality comes from someplace deeper than their belief in God. Consider that a much greater percentage of people believed in God in the Middle Ages, yet we as a society are far more moral today. I do think, though, that belief in God keeps some otherwise very good people from making a few obvious leaps. Gay marriage is a clear example. Stem cell research is another. Pressure on our friends in Israel to stop taking land that isn’t theirs and blowing up children when their parents complain is a third. So here’s my effort at gentle persuasion. Suppose we discovered that the stories of the Old Testament were true. Abraham really was commanded to slaughter Isaac, then was stopped at the last moment and richly rewarded for his blind obedience. The Angel of Death really did, on God’s orders, kill all of Egypt’s first-born. God really did mess with Job, really did confound language at Babel, really did all the other horrible things attributed to Him in the Bible. Now imagine we discovered the “God” of all these stories to be a space alien using advanced technology (Clarke’s “magic”) to control and manipulate us. How would we feel about such an alien? I think we’d not only judge this alien to be an immoral psychopath, we’d see this false god as a threat to humanity’s very survival. We’d fight back. Now, if this is so, what changes when we imagine God to lie outside the laws of nature? If the concept of a powerful space alien somehow manipulating and killing us raises our ire, then why shouldn’t a powerful but supernatural God do the same? When faced with a bully, aren’t we better off standing up for ourselves? Even if, later on, we discover the bully’s not really there at all?